This weekend was short and sweet or so it seemed. 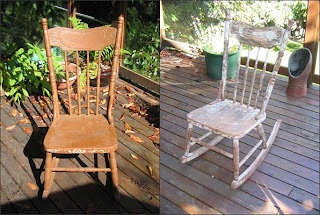 I volunteered at the Happy Cat Haven then did some thrifting and walked my new to me rocking chair home. One of the churches here had a sale and I picked up this rocking chair for $5. It's a medium sized one so was pretty light. I'm sure I looked a bit nutty since I had a hour half walk ahead of me as I carried my chair home. I ended up sanding for a bit Saturday afternoon so now I have the rocking chair and the art deco magazine rack to finish up in the next while. I think I'll sand off as much of the paint as I can then either add wood oil or stain then seal it. I want an au natural finish then I can add a funky pillow to the seat and be done. 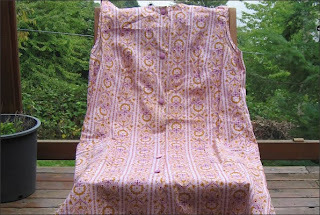 After sanding for awhile, I decided to sew up my 14" x 14" pillow covers out of the vintage smock. I picked up a deep pink for the back. 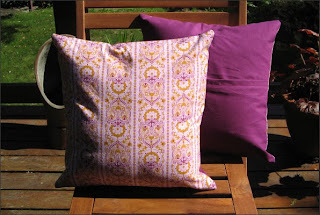 Now I think I should sew a 12" x 16" pillow cover to go with the set. Maybe a yellowish fabric. We'll see! 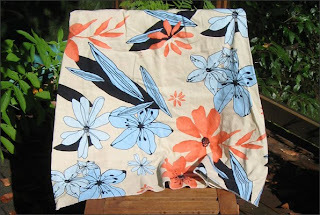 Next I'm going to sew a set of 16" x 16" pillow covers out of this skirt. I bought it at the Lions Gate Thrift Shop for $2 then picked up some dark linen for the back from Fabricland's bargain bin. Other projects include adding some felt applique to this purse I picked up at the Salvation Army for $2. 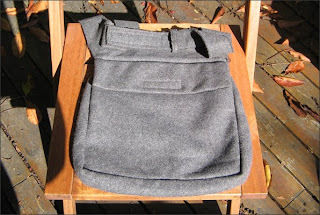 It's a nice grey wool over the shoulder purse. I don't need it so I'll make it snazzy then pass it on. I picked up these buttons at the Thrift Shoppe on North Road in Gibsons. 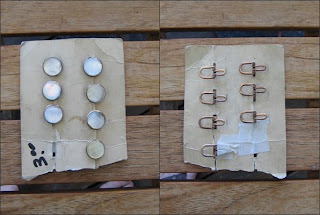 I'm assuming they're vintage buttons. They're very kewl with an interesting clasp on the back. They were $3. I'll have to find something to use them for!